Between 1704 and 1774, nearly 36,000 people were buried in Boston's three municipal graveyards (Copp's Hill, Granary, and King's Chapel). I started my count in 1704 because that is the first year in which the statistics were separated by race and I end in 1774 because the upheaval of the Siege of Boston in 1775 was a demographic catastrophe. The three high peaks are smallpox epidemic years: 1721, 1730, and 1752. What proportion of the city's dead were buried in these three municipal graveyards? Did that proportion differ for blacks and whites? Does the decrease in the % of black burials indicate a smaller relative population in later decades, or the use of a non-municipal burying ground? Is it safe to estimate the racial makeup of the city's population based on these numbers? 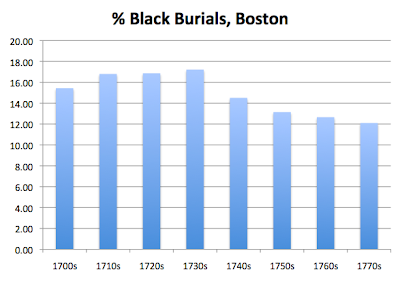 How many surviving gravemarkers commemorate black Bostonians from this period? I know of one (Frank, 1771, Granary) are there more @ Copp's Hill? 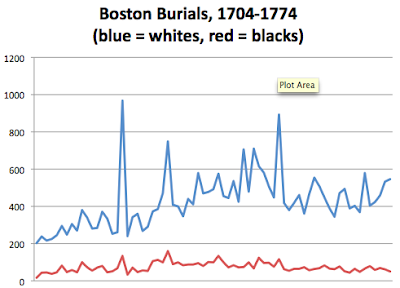 What % of black Bostonians were buried at Copp's Hill vs. Granary vs. King's Chapel?